A 'Black Lives Matter' protest is taking place after an officer-involved shooting in New Haven. Some residents are questioning officers' use of their weapons. A woman was shot during a police-involved shooting in New Haven early Tuesday morning and the witnesses described a scene in which police officers surrounded a car and fired several gunshots. New Haven police said their officers were not involved. According to Connecticut State Police, who are leading the investigation, the incident began when Hamden Police received a report of a possible armed robbery of a newspaper delivery person at the Gas and Go gas station at 144 Arch St. in their town around 4:20 a.m.
A Hamden officer found the suspect vehicle in the area of Argyle Street and Dixwell Avenue in New Haven. The Hamden police officer, assisted by a Yale police officer, “made contact with the occupants of the suspect vehicle” and police fired shots, according to New Haven police. State Police said multiple shots were fired by both officers on scene. A 22-year-old woman who was inside the vehicle was shot and suffered a non-life-threatening wound. She was taken to Yale New Haven Hospital and is currently in stable condition, according to State Police. According to a witness, a red car rammed police officers. 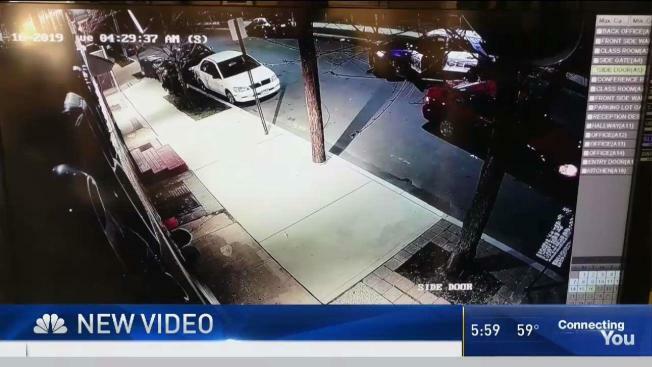 “The red car drove into the front of the cop car," said New Haven resident Michael Donorfio. Police say the suspect refused to follow orders, leading police to open fire. “The suspected party exited the vehicle in an abrupt manner turned toward officers at which point officers fired at least one round at the suspect," said Trooper Josue Dorelus of the Connecticut State Police. Witnesses said they heard several gunshots and video from the scene shows police officers with weapons drawn surrounding a red car. “They were just shooting. It was a crossfire. Bullets were coming from both sides,” Joseph Smith, of New Haven, said. Police said a male was taken into custody in connection with the incident, but it is not clear what charges the suspect faces. Dorelus said investigators are trying to determine if the suspect was armed. “At this point there is no weapon that was located." NBC Connecticut spoke with Rodney Williams, who identified himself as the suspect's uncle. “When you realize it’s your family even though they claim this or that I just still see after you look at the video how they just jumped out the car and they just start shootin’ how they’re shootin’. I don’t feel like people respect people as human beings," he said. “At the end of the day these officers got to understand that they got kids too and how would they feel if somebody shot they’re kids like that?" he added. Hamden's mayor said the officer involved has been placed on leave. State Police are investigating. Anyone with information is asked to contact them at 860-685-8190. Callers can remain anonymous.